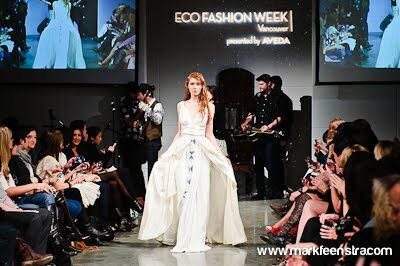 As with last season, Eco Fashion Week ended with the Prophetik show. The mood was set when the audience took their seats and found fresh-cut flowers on their seats with press releases. Antique props decorated both ends of the runway. Then the sounds of guitar music filled the air and fake snow began falling. The show opened with a long white gown befitting a fairy-tale princess. It was clear that Prophetik was preparing to take its audience on a romantic journey to the past. 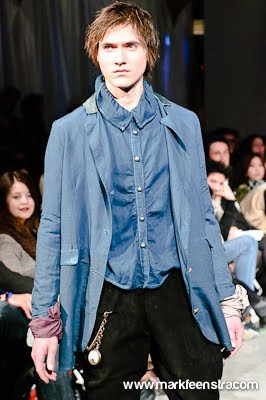 Tennessee born-and-bred designer Jeff Garner usually looks to history and pioneers for his sustainable fashion inspiration. But this season, he turned to the court of Louis XV. Titled "Artist Wonderment," his latest collection envisions a fantastical escape from Louis XV's regime "when art became frivolous, a slave to consumers, diseased of romantic snobbery" and into something more genuine. 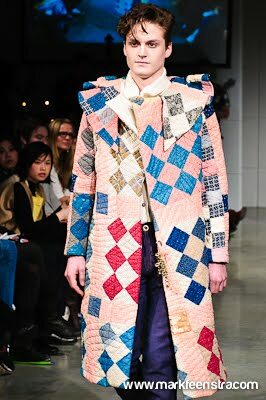 Patchwork proved to be a major motif. I'm usually not a fan, but the colours and fabrics in Garner's designs blended together harmoniously and the garments had sleek lines that counterbalanced their homespun quality. Eclectic fabrications were used: silk, organic velour, 100 year-old southern quilts (Garner's own bedspread from his childhood was reworked into a jacket), hemp, cactus silk, ostrich feathers. Pieces shown ranged from sweeping evening gowns for the women to breeches and dapper coats for the men. Music and accessories played a big part in the show. The catwalk's soundtrack was expressly composed for Garner by Thomas Ian Nicholas and Benjamin Ellin, while local bluegrass band Viper Central provided live entertainment. The shoes caught the eye of many a front-row member; they're the result of a collaboration between Prophetik and LA label CYDWOQ. Prophetik always puts on a great show. I can't wait to see what's next. 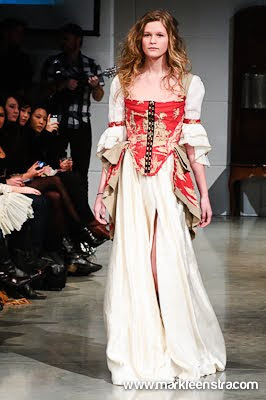 Thanks to Mark Feenstra for the runway photos. that red jacket is kind of cool but i'm not sure about the fairytale looking dresses - they look a bit costumey. I see where he's going with this but doesn't do it for me.